We had company over for the first time post-baby two weeks ago. Prior to baby, I thought spending time at home with one small, portable child who naps on and off all day would mean I’d have lots of time to menu plan and cook and get real fancy. I had big plans for this blog, for instance. Clearly, I didn’t spend any time with any children before abruptly shifting into 24/7, all baby, all the time, mode. So what made it to the table for company was a reliable friend: chicken and this simple, deceptively good salad. If using fresh peas (which are awesome), bring a pot of water to boil and very quickly pass the peas through – about 1 minute. You can also use canned or thawed frozen peas. Combine all ingredients together and toss with dressing; top with parmesan. This is an old reliable for good reason. Simple, easy, and super delicious. Definitely enough to impress post-baby company. 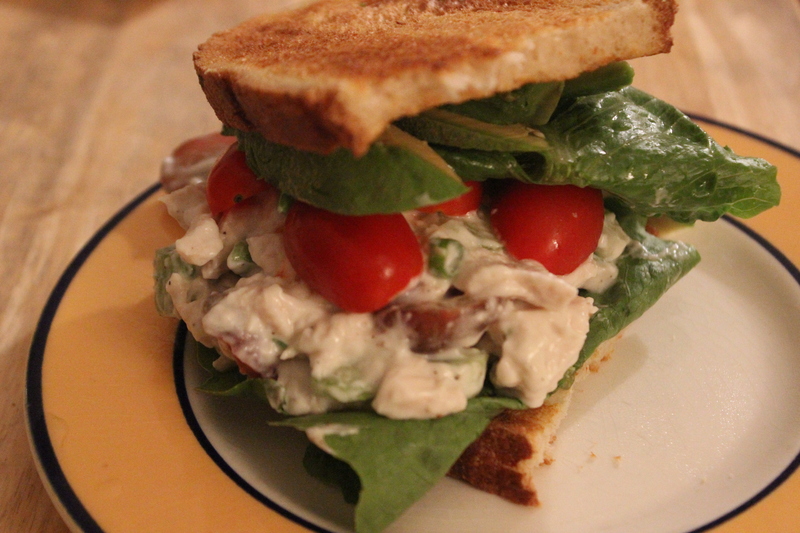 If I ate less chicken salad, I’d probably be wealthier. If I walk anywhere near a deli counter, or a sandwich shop, or a brunch menu with chicken salad on the menu, it’s game time. Part of the reason I love going home so much (other than of course seeing my parents, hi M+D) is because my dad always has a container of chicken salad chilling in the fridge. I. Love. Chicken. Salad. It’s a bit surprising, then, that I’ve never actually made it myself. I was in New York a few weeks ago, eating a chicken salad sandwich on a fresh, delicious sesame seed bagel with my sister-in-law, and she mentioned that sometimes she made chicken salad for herself. This was an earth-shattering revelation. For some reason, I have always assumed that magical chicken salad makers just lived at the deli/grocery store/farmer’s market, just waiting for their opportunity to hop me up on too much mayo. But no. I could make this delicious, addicting, amazingness myself. So I did. Add chicken and all poaching liquid ingredients to a pan and bring to a full boil. Turn down the heat and poach gently for about 10-12 minutes (the chicken should be white all the way through). While the chicken cooks, prep your veggies and grapes and place in a large-ish bowl. Remove chicken from the poaching liquid when done; discard liquid + contents. Let chicken cool a bit, and then cut into little cubes. Add to the veggies. Add mayo, yogurt, lemon, salt and pepper. Mix thoroughly and taste – add whatever’s missing. Put your delicious, amazing salad between two pieces of toasted bread, a slice of red onion, and a large Romaine leaf. Fall in love. HOW WAS THIS THE FIRST TIME I MADE THIS!?!?!?! Posted on October 25, 2015 October 25, 2015 Author varinajCategories chicken, salad, sandwichTags celery, garlic, grapes, greek yogurt, mayo, onion, thyme2 Comments on Homemade Chicken Salad.